I have no issues openly admitting that I am not the least bit able to sew. I can barely thread a needle and the buttons I sew back on last about a week. I decided though that I wanted to create Riley’s Halloween costume this year. This is Riley’s 3rd Halloween. I spent at least 40 dollars on her costumes for the past two years. Riley was 10 months and walking for her first Halloween and she was the cutest little monkey ever. Last year, she was a kitty cat, which ended up being perfect because the outfit was so warm and she wore her Uggs because of the snow on the ground. Yep, snow. Hopefully this year there won’t be any white stuff. Luckily, her outfit will go over the top of warm clothes so we should be good either way. For Riley’s 2nd birthday I made a No Sew Highchair Tutu so I knew a tutu was the way to go with this costume. I used gold and black tulle for the tutu, which has tiny sparkles in it. I love the way it looks, but it leaves an absolute mess behind. I keep telling Joe it’s like her pollen that she’s leaving behind. He’s not quite buying it so the tutu is banished to the laundry closet until Halloween. 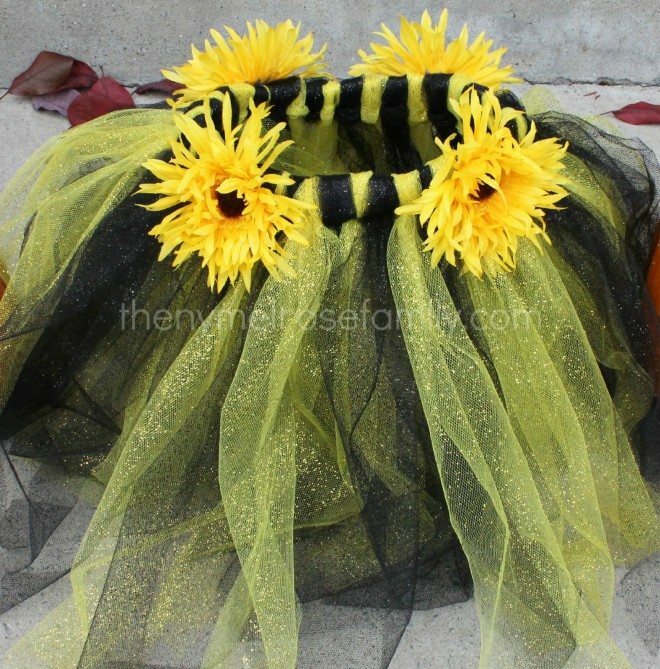 I hot glued sunflowers onto the outside of the tutu similar to how I did my Infant Tutu for my niece. There is a step by step tutorial on how to create a no sew tutu with the Infant Tutu. The wings were an 8 dollar find from Target in the Adult Costume section. They work perfectly over the top of Riley’s fleece. I can’t wait to see everything on her. Here’s hoping that she doesn’t throw a tantrum to put it on. I’m pretty sure the candy that she’ll get trick or treating is a good enough incentive. I still need to put together the bows for her pigtails, but other than that her costume is all set! I can’t wait to hear her say, “Trick or Treat?” again this year! This costume looks adorable. I hope you’ll post pictures of her in it on Halloween. I love watching little ones trick or treat. It will be my daughters third Halloween this year, and I can’t wait to take her. They are just too fun at this age. Thanks so much Tabby. Hopefully she won’t give me a hard time getting into it. I absolutely LOVE this!!! 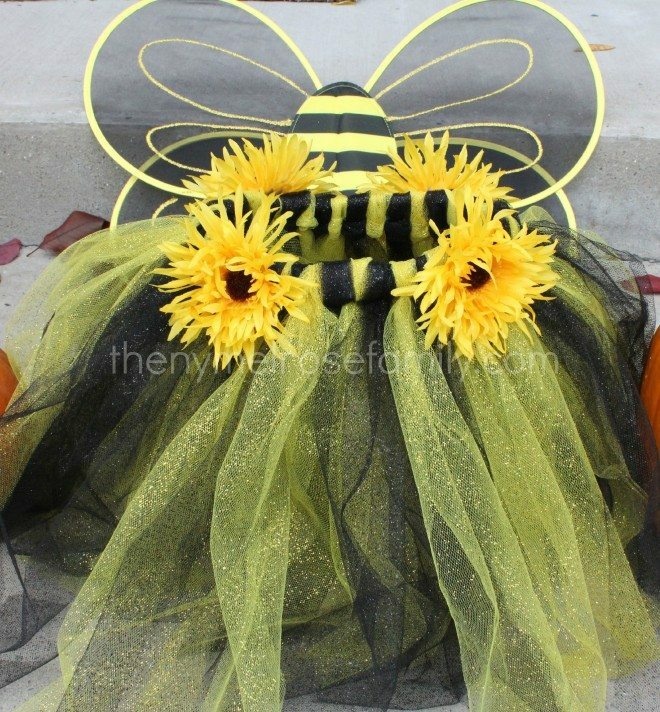 The tutu is awesome, and those bee wings are cute, too. I’d love for you to share this tutu and any other crafts at my new linky party, Submarine Sunday. I hope you’ll stop by! That is an ADORABLE costume! Love the tutus for girls cause they wear them so much for play and look so cute every time. Nice job! You’ve got my creative juices flowing!! SO cute! I was considering a bee for my little one before we went with a ghost. I’m a huge fan of the no-sew tutu. I’m not the best at sewing either, I have to get my sister to teach me better techniques! Hi Jenny, adorable little bumblebee and also your little girl! I am a new google follower, thank you for sharing. I think you might like some of the fun on Maddalee, why don’t you visit if you have a chance? The pillow has ultra deluxe comfort and has great memory foam and thus transmits to the body. Here you will find all abouut Bed Reaing Pillow tips and secrets. Use shells for enhancing your beach themed bedroom.